Whether a city is new to me or an old favorite, I always arrive with the goal of working my way through a long list of restaurants, bakeries, and wine bars. I usually leave time to visit each place exactly once, making a point to try the largest number of options possible and get a good feel for the local flavor. It’s rare that I’ll revisit a spot on a short trip, and three visits is almost unheard of. During a recent trip to Omaha, however, Kitchen Table completely won me over! 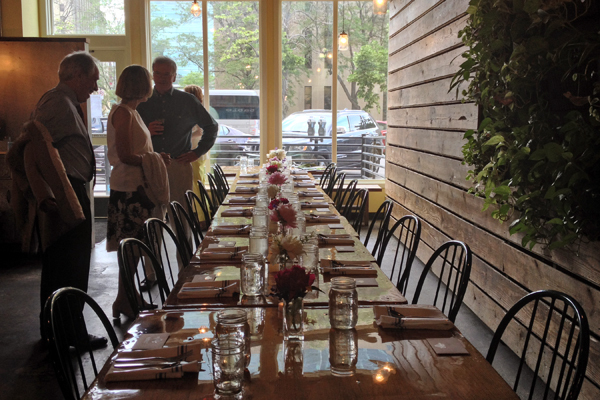 This adorable bistro is run by husband and wife team Colin and Jessica Duggan, who do an amazing job of whipping up creative, beautiful, and healthy meals; making every diner feel at home; and planning absolutely lovely events. Not only did they prepare multiple fantastic gluten-free lunches for me, but as this was our wedding weekend, they hosted an amazing, intimate, and delicious dinner for us as well! While one or two of these dishes were unique to our event, many are regularly on Kitchen Table’s lunch or dinner menu. They are all well worth a try or three! At lunchtime, Kitchen Table Omaha focuses on sandwiches and features a meat-based and a vegetarian daily special. This spot doesn’t offer gluten-free bread, but that’s okay because the gluten-free alternative far surpasses any sandwich I’ve ever had. Kitchen Table makes sandwiches gluten-free by replacing the bread with grits! 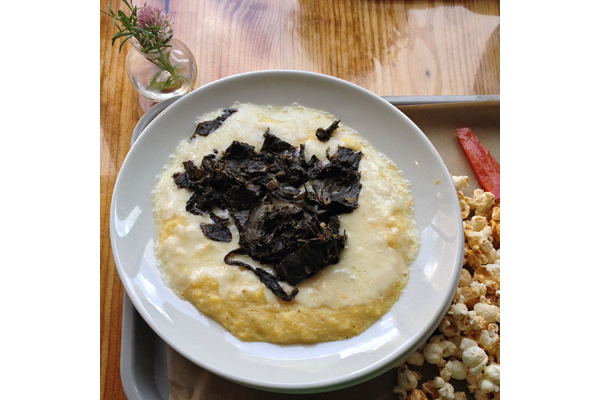 Instead of a standard grilled cheese with collards, gluten-free eaters get to enjoy the fillings served over a hearty bowl of grits. This is an absolutely genius idea that made the gluten-free options the superior choices for any meal. Kitchen Table focuses on unique housemade food, and even the sides that accompany the lunches are no exception. Popcorn is freshly popped and seasoned with a daily spice blend, which ranges from sweet fennel to smoky chile. Each blend is a little surprising and really tasty, especially when paired with a few pickled veggies. For our dinner event, we indulged in a series of courses, each somehow better than the one before. 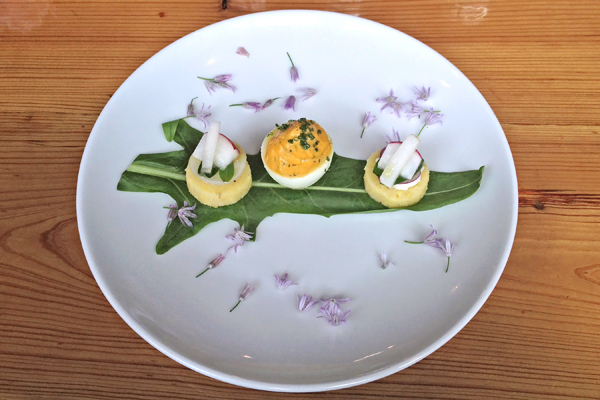 Dinner started with polenta rounds topped with radishes and paired with a deviled egg. Tiny purple onion flowers made this first course almost too pretty to eat! 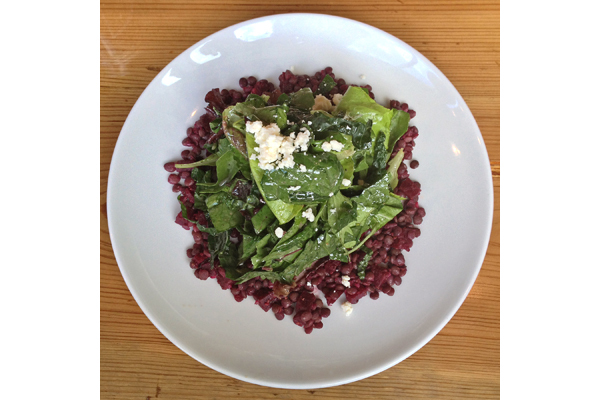 Fresh greens, lentils, beets, goat cheese, and a tangy vinaigrette made for the best salad. As a big fan of salads that balance veggies, proteins, fats, and flavor well, I could easily enjoy this as a meal on its own. Our main course played on the hearty bowl of grains theme, this time with rice. 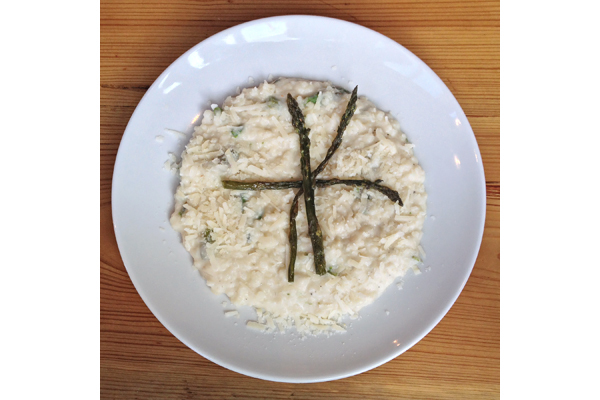 Kitchen Table’s risotto is rich, velvety, cheesy, and topped with slightly sautéed asparagus, exactly as risotto should be. For dessert, Colin and Jessica totally outdid themselves. 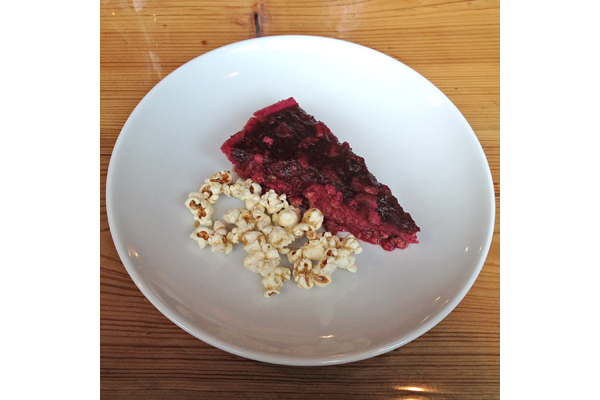 This candied beet and walnut cheesecake had a gluten-free popcorn(!) crust and was light and refreshing with a little sweet popcorn on the side. While not offered on the regular menu, this gem is the perfect example of how Kitchen Table approaches food: fresh, creative, housemade, and completely delicious. This spot is an absolute must if you visit Omaha, and it will continue to be at the top of my list each time I’m in town. Where? Kitchen Table is located in Omaha’s Old Market: 1415 Farnam Street, Omaha, NE 68102 (402-933-2810). « BIG NEWS: Introducing Our Gluten Free Around the World Project! 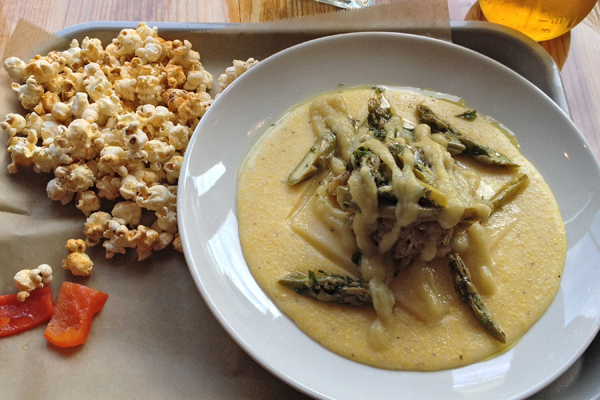 I’m hoping to make a fall trip to Omaha to check out a newly-opened restaurant and am adding a visit Kitchen Table to my agenda. Thank you for sharing this. Looks incredible! Johnna, I think I can guess what restaurant you’re referring to—I’ve heard it’s really great and can’t wait to hear what you think. Definitely stop by Kitchen Table for a meal or two, too! If you have time to wander around the Old Market area, KT is really the perfect spot.